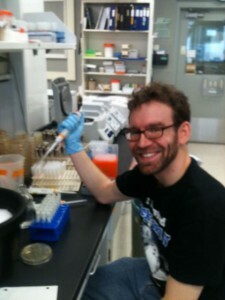 This week’s BEACON Researchers at Work post is by MSU graduate student Eric Bruger. Why play well with others when you can get away with just looking out for your own self-interest? This is a sentiment not only left to misbehaving children. Cooperative behaviors are difficult phenomena for evolutionary biologists to explain, in part due to the potential invasion of non-cooperating defectors into participating populations. The same can be asked about communication – why should robust, reliable communication be maintained over the course of evolution? On the surface, it would appear that natural selection alone would not favor the development and maintenance of these types of behavior. And as it turns out, microbes may present a great chance to examine these interesting evolutionary questions. The extent of microbial diversity is truly astounding. I may be biased, but in my opinion microbes are unequivocally awesome. Seriously, they are spectacular in many regards for practicing and aspiring biologists. Not only do they exhibit countless interesting and novel features that impact global ecosystems and processes, they are also extremely tractable from an experimental standpoint. I became very interested in microbes as a bacteriology undergraduate at the University of Wisconsin-Madison when I began learning about the immense physiological potential they possess. But did you know that they also have elaborate social lives? It isn’t news that organisms other than humans, from ants to apes, are capable of social behavior. However, long ignored in the field of social evolution, it is now appreciated that microbes are seldom found in isolation and display an impressive array of social and cooperative behaviors. Bacteria are capable of a variety of group behaviors, ranging from competitive, such as the production of antibiotics and bacteriocins, to cooperative, such as producing secreted exoenzymes and iron-scavenging siderophores. These group behaviors do not merely affect the participating population of organisms and may, for example, extend to positive symbiotic or negative pathogenic interactions with hosts. Notable among these behaviors is quorum sensing (QS), a form of chemical communication that can mediate regulation of groups of genes. QS has evolved in many different groups of bacteria, including important plant and human pathogens. In QS, cells produce a chemical signal released from the cell, and a coevolved receptor that can detect the signal in other cells, thereby leading to altered regulation of many genes, resulting in expression of downstream behaviors. Although different lineages may vary in their regulatory network designs and system components, the underlying concepts are similar. QS is used to regulate numerous genes in bacteria including those important for virulence, biofilm formation, motility, and bioluminescence. Though well-studied at the molecular level, evolutionary explorations of QS are limited. QS is proposed to be a mechanism to promote cooperative behavior in bacteria, but it remains unclear how QS is maintained when non-cooperators potentially have higher individual fitness. Currently, I am a PhD student in Chris Waters’ lab, where I work on a project that utilizes the gram-negative bacterium Vibrio harveyi. The primary focus is on the evolution of quorum sensing. Because it has a long-standing experimental history and a well-described quorum sensing system, V. harveyi is a great study system for these types of questions. A pathogen of numerous species of marine animals, V. harveyi causes significant economic damage each year to the aquaculture industry. Another notable feature of V. harveyi is its potential to produce light, or bioluminescence, by way of the luciferase enzyme. 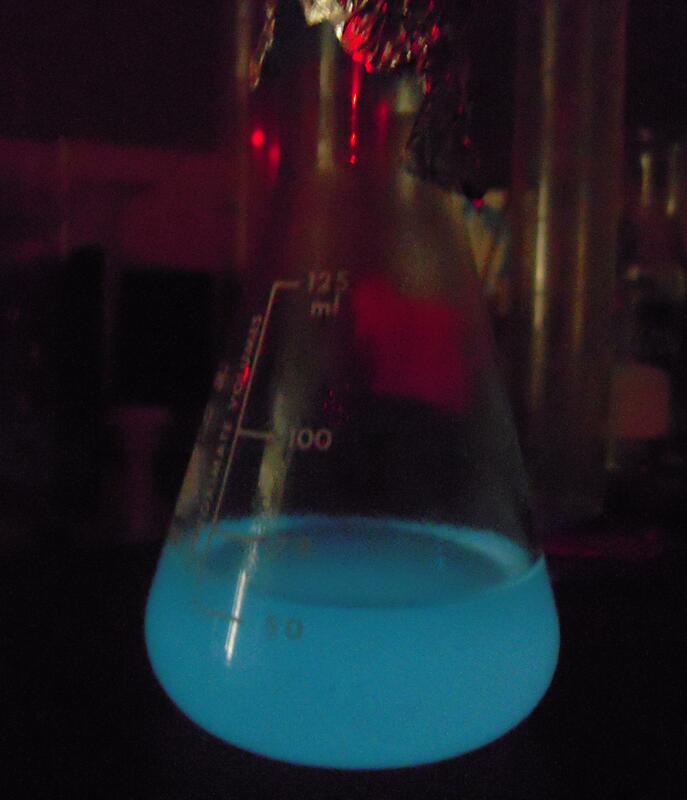 For our line of experiments, bioluminescence also serves as a great indicator that collective behavior is being turned on. Generally, behaviors regulated by QS are not turned on when cells are at low density. Bioluminescence is carefully regulated in V. harveyi by the level of signal production, such that sufficient signal to induce bioluminescence gene production does not occur until a large number of cells (~108 cells/ml) are present. In this way, QS is hypothesized to serve primarily as an organizer for the types of collective behavior that may not be beneficial to individuals unless performed at a large group scale. However, there is also the potential that QS could provide benefits to cells in a manner independent of the collective behaviors they often regulate. Performing these types of tasks that are costly to individuals sets the stage for a situation in which cheaters may emerge. In this context, a cheater is an individual whom does not contribute to a collective behavior performed within its resident population, but whom stands to benefit from that behavior being performed by others. Cheaters have been discovered in a variety of natural and artificial systems, often in respect to the production of public goods. We are attempting to address the question of how QS may be maintained by careful determination of costs and benefits inherent to QS. This is being done by performing long-term continuous culture experiments with wild type strains of V. harveyi capable of normal quorum sensing, as well as impaired mutants that mimic cells in perpetually locked low-density or high-density states. We are also pursuing genomic approaches to analyze changes arising in these lines over time in detail to the molecular level. In this way, processes that are entangled with QS regulation in ways not currently understood may also be discovered. The costs and benefits of participation in QS and other collective behaviors may also vary depending on the surrounding social environment and the overall levels of resources. I plan to monitor this in dynamic fashion by tracking the stability of QS in populations propagated in relatively nutrient rich and poor environments. We hypothesize that altering the available types and levels of resources that V. harveyi is grown on should affect the stability of QS. Additionally, ecological interactions are being checked over through competition between different types of QS variants. In this way, we may be able to unmask the selective contributions of both resource levels for the maintenance of QS, as well as the importance of the specific QS components to the overall system. Understanding the dynamics of QS in a model bacterial system has the potential for broad-reaching impacts. Application of general principles may allow for uses such as targeting QS for disruption to combat disease in plants and animals, as well as inducing desired QS-regulated behaviors for industrial production. Before that promise can be realized, though, steps need to be taken to supplement the current molecular understanding of QS systems with more information about their eco-evolutionary dynamics. For more information about Eric’s work, you can contact him at brugerer at msu dot edu. This entry was posted in BEACON Researchers at Work and tagged BEACON Researchers at Work, Biological Evolution, Cooperation, microbiology, quorum sensing, Vibrio harveyi. Bookmark the permalink.